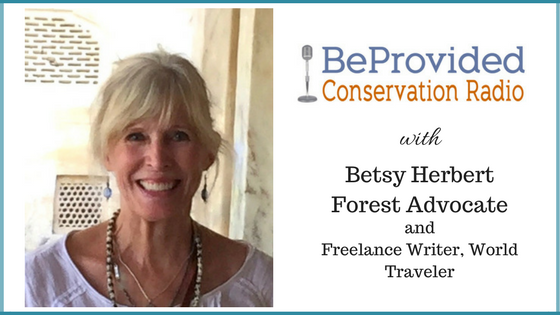 In today's episode, Grey Hayes and Marcia Sivek speak with Dr. Betsy Herbert about her life dedication to forest conservation, specifically redwood forests around the Santa Cruz Mountain Area. Betsy also shares discoveries made about environmental issues while spending a year traveling across the world. We had a great conversation near the shore of the Pacific at Natural Bridges in Santa Cruz, CA. "As an environmentalist, I’ve always held to the notion held by deep ecologists that wild nature, as it evolved through the eons, needs to be preserved as the foundation for life on the planet. Wilderness areas (Earth’s least disturbed places) are a priceless storehouse of our planet’s biodiversity. We need to protect wilderness — or else humans, along with other species that we share the planet with — will perish." The Santa Cruz Mountains Bioregional Council: http://www.scmbc.org - This is a great non-profit with a mission that encourages the preservation and enhancement of regional biodiversity over time through education, the dissemination of accurate scientific informal and assistance in the planning, coordination, and implementation of conservation efforts.